Still have any red ones with the metal flake? 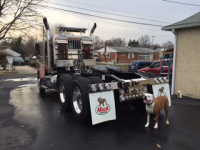 Nice truck & trailer! Going to give it a full resto? Nice truck! Would love to find a chrome steering wheel that those trucks came with. Looking for four 22.5 aluminum wheels. want something in good shape but they don't have to be perfect because they are going to be inside rims. Murf716 commented on 2000RD688's gallery image in BMT Member's Gallery - Click here to view our member's albums! Murf716 commented on 1961H67's gallery image in BMT Member's Gallery - Click here to view our member's albums! Looking for at least 2 but would buy a set of 5 roof light lenses for our 1977 R-model. The lense itself is stamped with part# LS336 & the base part# KD518 SAE PC68. If anyone has them or could point me in the right direction I would greatly appreciate it. I'm a big guy so I would never downgrade to a RD cab with the CH having twice the room. Finished product look great! Especially considering how rough they were to begin with.